Here we have a VERY special variety. 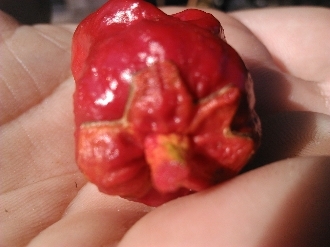 Not very well known of and considered to be a SUPER rare NUCLEAR hot pepper! We present the Bubblegum 7 Pot! There will be 20+ seeds per pack! !What makes it noticeably different from ALL other types of hot peppers is that when it ripens to red, the red color even "bleeds" into the calyx of the pod! Check out the picture as you just wont believe it until you SEE IT! :) Order yours TODAY! !